Author and Amazon veteran Kristi Coulter has found her voice. Funny and feminist — with a viral essay under her belt and a book coming out next year — she talks with The Seattle Times about what it’s like to be a woman working in tech. Funny now, when you think about the way Coulter’s voice — funny, acerbic, feminist — reverberated around the internet after she wrote an essay for Medium last year about all the “super double tanked” women around her. A columnist for The Washington Post remarked that almost every woman she knew had read the piece. Time, Slate and the New York Post chimed in. Within a week, she had a book deal seemingly well-positioned to make her a sought-after cultural observer at this moment of reckoning over gender roles. “Nothing Good Can Come From This,” her series of essays about quitting drinking and seeing the world newly sober, is coming out in August. Publisher Farrar, Straus and Giroux — comparing her to authors Cheryl Strayed and David Sedaris — plans to push it hard, Coulter said. The Washington Post recently interviewed Coulter for a piece about the current tsunami over sexual harassment, a subject that also animates her Facebook posts. “Do you guys understand how incredibly (expletive) dumb you sound?” she wrote, posting a New York Times story about men wondering if they need to cancel holiday- work parties and take other extreme measures so as not to unwittingly harass women. So why did Coulter have trouble finding her voice at Amazon? “It wasn’t that anybody was trying to keep me silent,” said the 47-year-old, who has worked at the retail giant since 2006, currently as the principal writer promoting the futuristic grocery store Amazon Go. In two hours of conversation at the Belltown cafe Assembly Hall, Coulter talked about what it’s like to be a woman working in tech, why she thinks sexual harassment is more pervasive in Silicon Valley than in Seattle and the inevitable backlash that comes with being a blunt female writer. In person, she’s more approachable and easygoing than you might expect from her writing. “I can be very acerbic, but I also don’t think that’s a great way to move through the world,” she said, though one senses having sharper edges might have helped her at times. Case in point: Ann Arbor in the late ’90s. Coulter, a graduate of the University of Michigan’s MFA creative-writing program, interviewed for a job with the founder of a company archiving movie and music data. “He asked me the least amount of money I could live on,” she recalled. She told him the truth: $30,000. He gave her $31,000. “Oh, child,” she said of the young woman she was, who never thought to negotiate her salary. She went on to take on a variety of roles, including West Coast editorial director of Amazon Publishing and coordinator of a leadership-coaching program, before assuming her current job at Amazon Go. At which point, a man on the panel jumped in to offer an even rosier view. And then another. And then — “just to make sure we have 100 percent male coverage on the topic,” she wrote — the third man on the panel. This is not an experience unique to tech. Still, she mused at Assembly Hall, tech has a lot of people who “think they know things they don’t know” — including, as she sees it, what it felt like to be her. Change, she said, has also followed an explosive 2015 New York Times piece that depicted the Amazon workplace as brutally demanding. She said she has not seen a harassing culture at Amazon, though she guesses there have been cases, as at any large company. There have, including an allegation against Amazon Studios head Roy Price, who resigned. That happened in October, after voluminous allegations against film mogul Harvey Weinstein unleashed the #MeToo movement. With more stories pouring forth by the day, it will take more time to know how any one company will fare in this moment of reckoning. But Coulter suspects predatory behavior — legendary in tech’s bro culture — may be less of a problem at Amazon because of its focus and relative maturity. “A lot of the stories out of Silicon Valley are from startups,” she said. Ones that create an environment geared for men just out of college: beer kegs in the office, foosball, video-game competitions. 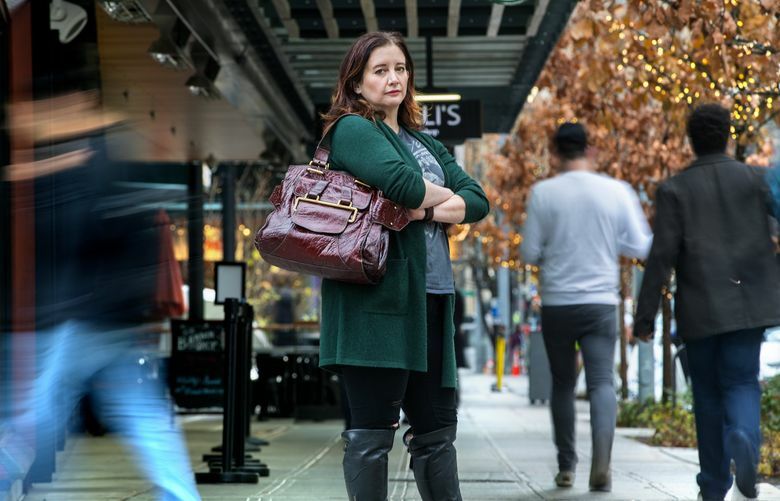 The Seattle area doesn’t have the startup scene that Silicon Valley does — yet; Coulter noted this region is getting more of one as people leave companies like Amazon and strike out on their own. And that, she speculated, may be why we’ve heard about fewer harassment stories here. That sounds like where she is in her writing career. After her essay came out, she got thousands of emails. Other letter-writers told Coulter she had changed their lives; they were quitting drinking, or quitting something. “Actually, I was kind of proud at the time that the word ‘patriarchy’ appeared in the Post,” she said, alluding to the paper’s conservative bent. But she said she wasn’t totally blaming the patriarchy. Feminism, from its earliest days, empowered women to drink and smoke, just like men, she said. Coulter looked at drinking through women’s experiences because, well, she wanted to write about women. The anger she got — that comes with the territory of doing so frankly, unapologetically, she figures.